natural materials like stone and tropical wood. included. We have wireless internet service with no charge. Honey moon or anniversary? Ask for our specials! the two others with two single beds each. There are two extra sofa beds in the living rooms. All our rooms have air conditionned, bedrooms also have fans. enjoy your meals if you wish to stay at home. 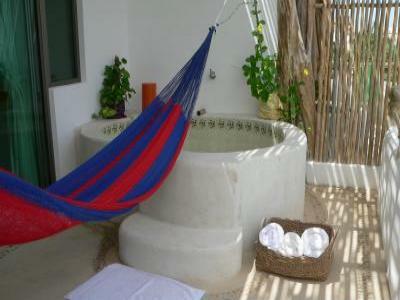 The apartment has its private terrace with jacuzzi, garden view. treatments to rejuvenate and reconect to your soul. Our rates are daily and in US dollars.